James Brown – an untrained musician, mind you, operating on not much more than feel, instinct and desire – revolutionized black pop music, setting off depth charges that would still be exploding a decade hence. Not to get all John Edwards-y about it, but apparently, there really were two Americas for a stretch during the late ‘60s and early ‘70s. There was the America that hung on James Brown’s every last whoop, holler, scream, cry, and exhortation of “good God!” “hit me!” or “Maceo!” (the latter being fully enunciated, as in “may-see-oh!”). This America – which was pretty much all-black -- saw Brown as the epitome of its attitude and brashness, at a time when said qualities were already a highly visible part of its zeitgeist. This was the period when Brown – an untrained musician, mind you, operating on not much more than feel, instinct and desire – revolutionized black pop music, setting off depth charges that would still be exploding a decade hence. Just about every record he put out was an event, and his concerts were not to be missed. And he was doing this while managing an enterprise far beyond the norm: between 1969 and 1971, he had three different aggregations of musicians behind him. But there was that other America, which was anything but all-black, and those folks had no idea in the world all this was going on. Other musical geniuses – Jimi Hendrix, Miles Davis, Sly Stone – were dismantling the boundaries of black music in their own ways, but they were doing it in full view of everybody, at festivals and rock clubs and on the sales charts. And their messages weren’t as undeniably and unabashedly black as Brown’s was. Even if Brown wasn’t a card-carrying militant (he made it his business to curry favor with Richard Nixon, something the Black Panthers never considered), his music exuded blackness in its rawest form. That, apparently, was a bit much for that other America. Even at his peak Brown never enjoyed the pop crossover success of Sly, or of any of the countless acts that followed in his footsteps, nor did he get anywhere near the credit from critical circles that his singular accomplishments deserved. Now, of course, it’s all different. It took a while, but folks finally came around to seeing, hearing and feeling the full extent and power of his work. A new generation of undeniably and unabashedly black music performers used much of Brown’s oeuvre as cornerstones; by sampling his records early and often, hip-hop gave Brown’s art new prominence (and helped launch various reissues of it) at a time when he was getting more headlines for his private and legal misadventures. Key musicians in his band – bassist Bootsy Collins, guitarist Jimmy Nolen, drummers Clyde Stubblefield and John “Jabo” Starks, trombonist Fred Wesley, and the aforementioned Maceo Parker on sax -- received praise for their contributions, something that didn’t happen much if at all in their time. Scholarship, reportage and critical appreciation of his music grew so much, The James Brown Reader emerged three years ago to collect the best of it. He was recognized as an American cultural treasure by no less august a body than the Kennedy Center. 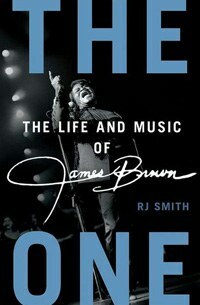 So it seems a bit odd to realize that RJ Smith’s brand-new The One is the first major biography of Brown to cover his entire life, from his hardscrabble youth in '30s South Carolina to his death on Christmas Day 2006. Smith’s numerous interviews, prodigious research, close study of Brown’s music and performance, and pitch-perfect writing tone resulted in a work that is exhaustive, illuminating, and as fun a read as such tomes can be. “The one,” in James Brown lore, is the source of that which makes funk funky, and everybody knows by now that James Brown more or less made funk a world onto itself. Specifically it’s the first beat in a measure, but “the one” is not so much a musicological place as it is a spiritual place, as the navigation of that beat is invested with age-old rhythms and nuances that end up propelling the rest of everything else – the tune, the band, the audience and Brown himself – into a strutting, rump-shaking beatitude. Smith illustrates how Brown’s background – a street-dancing kid whose artistic role models included a boxer and a charismatic preacher – led him to the essence of the one. And he gives extensive space to the mostly unheralded sidemen from Brown’s band of the late ‘50s and early ‘60s (Lewis Hamlin, Nat Kendrick and especially New Orleans-bred drummer Clayton Fillyau) who gave shape to Brown’s basic musical vision. There’s a mighty good reason one of Brown’s nicknames was “The Hardest Working Man in Show Business” – he probably was. After the success of his very first record, 1956’s “Please Please Please” (has a debut song ever established its singer’s artistic character more convincingly? ), Brown spent months on the road and countless trips to the studio in search of hit number two. He finally got it (“Try Me”, 1958), but had gained something else far more critical – the ability to construct a memorable concert experience. That, combined with the money to be made from said experiences, enabled Brown & company to become a rare thing by 1962 – a swaggering, road-tested juggernaut that flew all but completely beneath the radar. Even a lot of black folks had no idea who he was. That changed with the release of Live at the Apollo, his 1962 concert album (a recording Brown paid for out-of-pocket, thanks to all that money he’d made on the road). With apologies to Pet Sounds and the rest of the ‘60s rock canon, this was the first release to tap the artistic and cultural potential of the album format for pop music. He and his band whipped the notorious Apollo Theater audience into a frenzy, displaying uncommon mastery of emotional dynamics and musical precision (the latter doubtlessly sharpened by Brown’s lifelong practice of fining musicians who screwed up on stage). It became a phenomenon, with deejays playing pre-release demos of it all the way through for its entire 33 minutes (not that you could easily or properly separate one song from another, such is its flow and intensity). That word-of-mouth forced the irascible Syd Nathan of Cincinnati’s King Records, Brown’s recording home since day one, to get over his issues about the album and give it a proper release. Its success gave Brown the upper hand in his prickly relationship with King, and made him a full-fledged star, no longer an underground phenomenon. From that point, the music deepened as the star rose. Brown seemed to be possessed of a drive to please, to exceed, to put on not just a show but a spectacle. And that he did, as a one-man barnstorming carnival: for all his extensions into the modern world, Brown never left behind the black show-biz traditions of his youth, the tent show and the chitlin’ circuit. A typical James Brown extravaganza came complete with many of those really-old-school conventions: multiple acts, razor-sharp showmanship and a showstopper of a finale, the cape act (which Smith gives its own chapter, such is its centrality to Brown’s art). And oh yeah – a helluva band, largely made over from the early ‘60s group, which in only a few short years put its own stamp on black pop, and recorded its own incendiary live album at the Apollo. By the late ‘60s he’d had a few pop hits, but that’s not where his impact was. His effect resonated everywhere within black life: there was the emotional urgency of soul music, there was the hopeful ambition of R&B, and there was James Brown, a genre onto himself encompassing both urgency and ambition, plus the self-asserting audaciousness of his bold, fearless funk. He became a cultural marker for more than just music: poets saw him as the very essence of blackness incarnate; politicians glommed onto his mojo; and he became a hero to the global downtrodden (even Bob Marley worked in some Brown references in one of his early records). But it seems that music was the only thing that Brown did well, according to Smith’s work. He raked in the cash on the road, but for years never bothered with anything so much as a bank account, and paid the price once the IRS caught up with him. He got some attention for his business acumen as a radio station owner with his fingers in other pies, but all those ventures collapsed. He was King’s cash cow for years, but after the label’s demise in the late ‘60s, his new label, Polygram, was somewhat less forgiving of his excesses. He had a bunch of wives, and even more women on the side. And it was his mercurial temper, stubborn pride, and drug addiction that famously landed him in jail after a two-state police chase in 1988. The last two decades of his life contained virtually no new music, just drugs, women, guns and tours with a much lesser band and a greatly diminished spotlight. It’s as if he never stopped being that hungry, restless kid who used to dance for nickels on the street; his appetite wouldn’t let him rest even after he’d had more than several bites at the apple. Yet, although Brown’s music and influence circled the planet, he died right where he’d kept a home most of his life, in Augusta, Georgia. But all his excesses are forgiven, or at least artfully explained, within The One. Smith’s writing here is much more concise than in his previous book, the insightful but often all-over-the-map The Great Black Way (Public Affairs, 2006), even as he considers the long arc of a man whose art took him literally from the streets to the penthouse. The former book is fascinating in stretches for its exposition of little-known history, but suffers from the lack of a clear focus for the reader’s attention. There’s no lack of focus here, even as Smith takes on and fleshes out virtually every conceivable aspect of Brown’s career. It’s as if Smith himself learned from Brown the virtues of staying on the one. The One is so complete a portrait of a complicated, talented and driven man, that after reading it, it’s hard to imagine anyone who isn’t James Brown playing the lead were there ever to be a James Brown biopic. One might instead envision a new, funkier take on the whole Mount Rushmore concept, with Brown alongside Hendrix, Davis and Stone as the four men who reshaped black American music simultaneously, on parallel tracks, during a most volatile period in American culture. Smith convincingly establishes Brown as a triumphant product of the uniquely American tangle of race, art and commerce, a point proven long before his final hit, the jingoistic-by-design “Living in America” (1986). On that point, it’s safe to say, all the various Americas floating about these days would probably agree.